Port of Belledune. Strategically located to ship abroad. Port of Belledune launches new micro-site! Belledune NB – The Belledune Port Authority (BPA) is pleased to announce MAN Diesel & Turbo Canada Ltd. (MAN Diesel & Turbo) will be the first tenant to occupy the Belledune Modular Fabrication Facility at the Port of Belledune. Commencing April 2, 2012, MAN Diesel & Turbo will lease the Belledune facility for a five-month period to begin the fabrication and assembly of an electrical module destined for Nunavik, QC. This lease will provide employment opportunities for local contractors, local service providers and the Port of Belledune will see an increase in shipping activity. The federal and provincial governments supported the construction of a new facility at the Port of Belledune that would enable the lay-out and production of pre-assembled units for use in local, national and international projects. The Province of New Brunswick invested $7 million towards the construction of the Modular Fabrication Facility while the federal government contributed $1.5-million through the Atlantic Gateway and Trade Corridor Initiative; additionally, ACOA provided a $3.2 million loan toward the project. The Belledune Modular Fabrication Facility is a state-of-the-art facility built at the Port of Belledune. Not only does the port connect to strategic shipping routes, it is also an intermodal gateway serviced by CN Railway and has direct congestion-free access to a highway system spanning North America. The BPA is innovative in developing its port services and facilities to the fullest, enabling it to become an anchor of the economy in New Brunswick and eastern Canada. Access to Rail and Trans-Canada Highway. The Port of Belledune is strategically located to easily access raw materials for your fabrication needs. State-of-the-Art Fabrication Facilities. Learn more about the Port of Belledune's Modular Fabrication Facilities. Strategically Located on Arctic Shipping Gateway. The most flexible choice for moving project cargo into the Eastern Arctic, Newfoundland and Labrador. Easy Access to International waters. Learn more about the Port of Belledune's location and easy access to internation shipping routes. The Port of Belledune is located on Chaleur Bay in northeastern New Brunswick, Canada. It lies on approximately the same line of latitude as Nantes, France, and the same longitudinal line as the UK Virgin Islands. Not only does the port connect to strategic shipping routes, it is also an intermodal gateway with a rail spur and direct congestion-free access to a highway system spanning North America. The Belledune Port Authority is innovative in developing its port services and facilities to the fullest, enabling it to become an anchor of the economy in New Brunswick and eastern Canada. 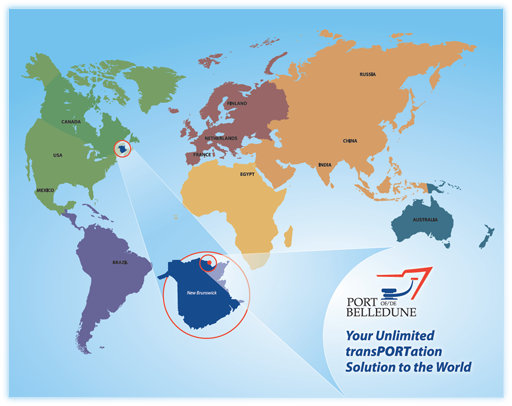 The Port of Belledune is your transPORTation solution to the world! Copyright © 2019 Port of Belledune. All rights reserved.